The topic of representation in superhero narratives isn’t going away any time soon, and Asian/Asian-American representation has become a particularly prominent subject in the past year as audiences become increasingly frustrated with the whitewashing and sidelining of Asian characters in pop culture. (See: Twitter’s #whitewashedOUT hashtag.) Marvel’s Netflix series have been key offenders with the disappointing portrayal of Asian characters on Daredevil’s second season and the casting of a white lead for the upcoming Iron Fist, a property with problematic roots in both Orientalism and the white savior trope. But superhero comics have made some strides with Asian representation over the last few years. Right now, Marvel has three ongoing series with Asian-American leads—Ms. Marvel, Silk, and Totally Awesome Hulk—and each of them features creators of Asian descent as either writers or artists. Writer Greg Pak, artist Mahmud Asrar, and colorist Nolan Woodard’s Totally Awesome Hulk is currently teaming up Marvel’s Asian-American heroes for the first time, and the opening issue of that arc (check out our preview) was a delightful exploration of these characters’ Asian-American identities and the joy they find in being around other heroes who can relate to their personal experiences. The storyline feels like a direct response to #whitewashedOUT, putting Asian-American heroes at the forefront while openly acknowledging how important it is for Asian-American readers to see themselves reflected in the media they absorb. DC Comics only has one series with an Asian lead, but it’s an especially compelling title. Written by Gene Luen Yang—an Eisner Award-winning cartoonist, MacArthur Fellow, and the United States’ current National Ambassador For Young People’s Literature—and with art primarily by Viktor Bogdanovic, New Super-Man tells the story of Kenan Kong (all names are presented in Western notation with the surname appearing last), a teenage bully from China who gains the powers of Superman after being experimented on by the Chinese government’s Ministry Of Self-Reliance. The first arc of the series introduced Kenan and the Justice League Of China, which includes Bat-Man (Baixi Wang) and Wonder-Woman (Deilan Pang) as well as the main enemies of the Ministry Of Self-Reliance: the Freedom Fighters of China, who are based on the Freedom Fighters that have fought alongside Uncle Sam in past DC Comics. Yang is taking established DC concepts and reinterpreting them for China’s cultural and political climate, and the strength of New Super-Man shows the benefits of venturing outside of Western tradition in superhero narratives. Yang’s journey at DC Comics has been a bumpy one. He started with a high-profile gig taking over Superman from Geoff Johns, working with legendary superhero artist John Romita Jr. to help usher in a new phase of Superman’s life that had his secret identity becoming public knowledge. Being part of a major overhaul for the Superman line unfortunately meant a lot of editorial restrictions, and it was obvious that Yang wasn’t given the freedom to let his imagination run wild and do his own thing with the property. 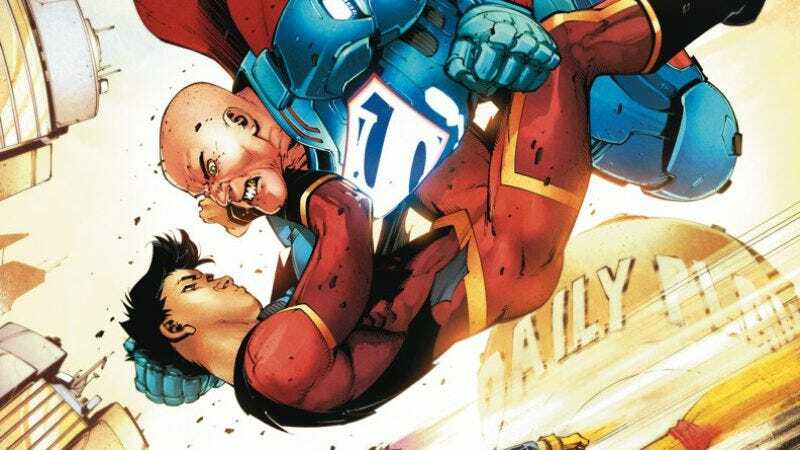 With New Super-Man, DC wisely gave Yang the opportunity to come up with his own distinct take on Superman (along with a number of other DC characters), and the results have been significantly more engaging and exciting. Yang is building up a brand-new corner of the DC Universe with this series, and there’s a wonderful sense of discovery as he reveals new aspects of China’s superhero landscape. The two-parter in New Super-Man #7 and #8 improved on the series’ already strong opening arc by introducing the Academy Of The Bat, the training center for the Ministry Of Self-Reliance’s agents, and adding I-Ching to the cast as Kenan’s personal advisor. I-Ching first appeared in the Wonder Woman comics of the late ’60s as the martial arts master who mentored a powerless Diana Prince, and he’s the perfect character to help Kenan discover the full extent of his powers. I-Ching does this by explaining how Kenan’s superpowers are tied to the Bagua, an ancient representation of reality’s foundational principles that is one of the major symbols of the Taoist tradition. It’s a brilliant way of tying Kenan’s abilities to Eastern philosophy, and in order to reach his full potential, Kenan has to navigate the Bagua and become in tune with each of its eight trigrams. This isn’t a quick process, and it requires a lot of work on Kenan’s part. But Kenan is headstrong and impatient, so when he’s given the chance to bypass this work in New Super-Man #9, he’s quick to embrace it despite warnings from I-Ching. This opportunity comes courtesy of Lex Luthor, who flies to China to bring Kenan overseas so he can open a dimensional portal containing energy that can quickly unlock Kenan’s superpowers. It turns out this portal is actually the doorway to Diyu, which is basically hell in Chinese mythology, and by opening it, Kenan puts the entire world at risk. Luckily, the China White Triad has been keeping tabs on the portal thanks to Avery Ho, the Chinese-American speedster introduced in the opening arc of the current Flash series. The “Coming To America” arc features the return of regular artist Bogdanovic, but the rest of the art team is new to the series. The addition of Jonathan Glapion as inker makes a lot of sense given Bogdanovic’s stylistic similarity to Glapion’s frequent collaborator Greg Capullo, and the inks reinforce the fine detail of Bogdanovic’s pencils. That Capullo influence gives Bogdanovic’s art an intense dynamism that energizes Yang’s story, and the appearance of Avery Ho is a particularly thrilling moment as she speeds into action to deliver a supersonic punch to Kenan’s face. Colorist Mike Spicer’s bold palette heightens the spectacle with vibrant pinks and a rainbow gradient for the Diyu portal, and he also handles atmosphere very well, particularly in capturing the inspiring splendor of Metropolis’ gleaming skyline when Kenan first sees it. Spicer’s rendering is more textured than what Hi-Fi was doing on the first arc, giving the visuals a painterly quality that enriches the linework. Yang continues to make New Super-Man a place to spotlight DC’s characters of Chinese descent, and it’s refreshing to see a book so committed to improving representation, not just in the cast, but in the plot points. By bringing in elements from Chinese pop culture, politics, and mythology, Yang is creating a story with a specific point of view unlike anything else in American superhero comics, and he’s also not shying away from how DC Comics has failed with Asian representation in the past. Last month’s New Super-Man #8 ended with a legitimately shocking cliffhanger revealing Ching Lung, the extremely racist stereotype that appeared on the cover of the first issue of Detective Comics, the series that gave DC Comics its name. If Rebirth is about embracing the history of the DC universe, then we do have to go back to the very beginning, right? If we really want to embrace who we are as Americans, we have to look at both the good and the bad and the pretty and the ugly of our history. If Rebirth is about reclaiming a lot of DC’s past, we also have to examine some of the ugly stuff, too. This thoughtful approach to the history of Asian characters in superhero comics is a big reason why Yang’s work on New Super-Man is so effective, and he’s ushering in a bright future for Asian characters at DC Comics without forgetting the sins of the past. The ideas he’s introducing in this title are full of potential, and hopefully this series will run long enough for Yang to realize all the possibilities of this burgeoning corner of the DC Universe.